By the time he was twenty-one, Antoine-Jean Gros had become a painter of the victorious French Revolution and Napoleonic wars. After meeting Josephine in Genes, he was received by her husband and assigned to an art expert position; basically, he was helping the army with the spoils of war. The loot was later organized by Dominique-Vivant Denon into the Universal Museum of Napoleon. Previously in Genes, Le Gros was in voluntary exile, living off portrait painting. In revolutionary Paris his life, in spite of the patronage of Jacques-Louis David, was in danger. Le Gros was of aristocratic origins and wisely decided to wait it out in Italy. By the early 1800’s, he was back in Paris and produced several monumental canvasses anticipating Romanticism, but also continued with portraits. Dominique-Alexandre Legrand was Napoleon’s aid-de camp, who lost his life on 2 May 1808 after receiving a flowerpot on his head. The incident took place in Madrid during the Spanish uprising. His therefore, was a posthumous portrait commissioned by a bereaved father. The painting could be viewed in the tradition of the late XVIII century aristocratic portrait, the Imperial aristocracy aspiring to match the Ancien Regime, while striving to invent their own, more militant style. As to the background, it is even more baroque, reaching out for inspiration to the landscape with ruins, the latter tradition being more nostalgic and with a larger emotional pool. Style Empire continued after the Bourbon restoration to the throne of France. The Style is well understood in furniture and other decorative arts, but in painting, apart from the portraits of the Emperor Napoleon I, Josephine and a few of her ladies in waiting, we can see it as problematic. The problem is that we may find separating the Empire from its progenitor, the Neoclassicism and its progeny, the Romanticism as somewhat of a challenge. Nevertheless, the differences do exist, and to point them out, I would like to take a quick look at the painting by Auguste Couder, The Death of General Moreau. What Napoleon’s propaganda machine had in mind was a paradox — it was a strange idea, the idea of compromise between austerity and luxury, perfectly conveyed by Aguste Couder in the picture through the combination of red and golden-yellow, simulating oriental opulence, as well as military camp, offering us both drum and bugle and most importantly the chief attribute of successful campaign, a mountain of loot. It’s not easy to combine opulence and austerity, but in this picture, I believe, the ingredients are skillfully reunited. The year is 1814. Yes, the year is 1814. The defeated Napoleon has abdicated and Louis XVIII gives the first Painting Salon of the restored monarchy, where a young artist, Auguste Couder, a pupil of Jacques-Louis David, presents his work. And by the way, do you know who is the dying hero in the painting? Oh technically, this is a traitor to the cause of the First Empire, someone whom Napoleon accused, tried, magnanimously pardoned and exiled, and who in the course of subsequent years drifted to the enemy camp, that is into the service of the Russian Tsar, and by so doing, traced the trajectory for many of the Emperor’s veterans: in 1814 most of them find themselves in the service of Louis XVIII. We get a sense of complexity of the subject matter. The dying general is an ex-hero of the French Revolution. The protagonist, perhaps unjustly accused by the First Consul Bonaparte, possibly jealous of his rival’s military successes matching his own, becomes something like an anti-hero. The peripety is well-known to the onlookers. It takes them to his last battle, where advising the advancing on Paris Russian troops, he gets his legs blown off by a French projectile. “Serves him well!” you imagine a patriotic Frenchman conclude at the Salon of 1814. Nevertheless, observe the royal white of the death-bed, the intensely zigzagging adjutant’s body ready to commit to paper the Moreau’s last words. Sh-sh! I can’t make it out. What is he saying? On my grave you can write whatever you like? I guess. The Russian Tsar Alexander-I very wisely arranges for the interment to take place in Saint Petersburg. “Thou shalt not blow pot smoke into the face of thy pet!” was the thirteenth commandment according to William Burroughs. The effort to upgrade the moral standards according to the needs of society is an ever-going process; and over the course of centuries, we turned populations of criminals into law-abiding citizens as we created new populations of criminals out of former law-abiding citizens. “Thou shalt not keep an old children’s book on your library shelf!” for nothing corrupts the young mind worse than an uncensored nursery rhyme, or the original version of a fairy-tale where no woodcutter comes to the rescue of a mischievous little girl who talks to strangers while taking short-cuts through the forbidden forest. I believe that an old moralist tradition rife with conventional and somewhat retrograde wisdom, is not any worse than a new one, for both are equally good for a laugh. Not all humor is ha-ha, of course, some of it could be he-he, and other is closer to hm…, but whichever is your natural disposition, allow me to elucidate here the moral message of the above painting by Hubert Robert, the painting that anyone happening to be in Paris can see in a small and quite neglected by tourists museum of Cognacq-Jay. A fall, even as the result of stepping on a banana peel, always contains moral lesson. You know you deserved it. But I leave my reader to his introspective reasoning, for I am more curious about the gentleman in the picture: what might have been his infraction? What had he done to deserved this triple punishment — falling off some kind of an ancient temple and into a sarcophagus and then receiving a huge piece of loose masonry on top? Before we touch upon why, an astute observer can help me with how: we see how he got up there — there’s a long ladder leaning against the building. Devil made him do it, of course, but what else? The man grasps something in his right hand. We cannot make it out, since the detail is too small, but we can infer that it is the same object the fleeing woman holds in her hand, probably a small bouquet of flowers. Obviously, the terrible punishment does not match the crime, if we can call crime what looks more like a safety or risk management issue. And there an onlooker is likely to remain as baffled as I was when trying to crack the code of this late XVIII painting. Is the puzzle even decipherable? It should be, given that the author of the rebus was a simple mortal, creating in a well-understood historical context. True enough, for a painter of ruins, all ruins offer ethic and aesthetic lessons. The first one is about vanity of our pursuits. The second is more subtle and is often due to a shere scale of the site, and as we try to surmise from the skill demonstrated in the execution of a fragment and complete through the work of imagination the rest, gradually arriving at the quality and size of the whole, which is quite comparable or sometimes superior to our present ability and skill, the artifacts dwarf and humble our unequal idea of the past, bringing our emotional reaction to the point of astonishment, or even consternation or someting close to sacred awe. At that euphoric moment a moral flaw that deserves to be squashed without mercy is none other than callousness, insensitivity, and obtuseness shown in the presence of a ruin. And if we fail to appraoch the ruin with tripidation, a different type of horror, more trivial like a stupid accident will substitute itself for the sublime. To each according to his ability. The aesthetics is replacable by the sensational. Such intolerance to simple pleasures we would find intolerable. Actually, they did too. I don’t know about my reader, but myself when in the presence of Hubert Robert’s paintings, I am subject to hearing hallucinations. Whenever I put my ear close enough to a guilded frame, I hear a metallic noise: it sounds like a ghostly figure dressed in lace and silk stockings is sharpening a large rectangular blade to be fitted into a different, much cruder and much larger wooden framework. Many of my American friends feel claustrophobic in Parisian hotels — it’s too tight, too hot. They completely miss the idea of boudoir! It has to be tight, it has to be hot, especially when outside it it is not. Sometimes before taking a leak, there is a bit of choreography one needs to follow: open the door, take a step to the right of the toilet bowl, turn around, and close it. Then take half a step back to the closed door, and slipping between the door and the toilet, finally sit down, pretty much the same way the heroine of Bouche’s painting does it. If you don’t appreciate the experience, you will probably not understand rococo, for it has been noticed that the distinguishing feature of the movement is the movement into the interior, into what constitutes everything that is private and intimate; and so, the very idea is situated between the two screens, between the two doors, next to the open fireplace and the inner thighs — in a word, the interstices — all that is tight, hot, soft, and fuzzy. To see the original painting, you need to hurry to the Louvre: It is there till January, 11th at the exhibition titled A Swede in the XVIII Century Paris. From one language to the other the most confusing subject to learn is prepositions: there are no correspondences between them. Is this why a quantity of ink was spilled over translating Virgil’s “tears for things?” I guess preposition could be at the heart of the problem. Although choosing between for and of seems like a strange issue: things do not really cry. Nevertheless, there is an order of things, like Hallmark cards, that has a potential for touching various sentimental cords in our bosom, and therefore should merit an appelation of tearful, or capable of invoking sad thoughts. Undoubtedly, the French Revolution left in its wake such hot buttons that vie with antiquity for the emotional pool of those given to contemplation. A new unfathomable pool was created, stretching from sublime to ridiculous and back to sublime, which even the Romantic XIX century failed to drain. Tearful things were left for us to muse over, weighing thoughtfully prepositions, moving words on page, words about tears and their things. It’s not easy to find the right preposition there, especially when there is none. “Et in Arcadia ego.” At the end of his essay on Poussin’s painting, Irwin Panofski mentions Goethe. Goethe’s travel journal made use of that Latin expression in a different way — “Me too I’ve been to Arcadia” seems to say the poet. “Auch ich war in Arkadien.” There is no reference to death, assures us the art critic. What we have is a tourist sending home a postcard and nothing else. It would be a morbid idea to think otherwise, to suppose that every time such a postcard is sent, we receive a momento mori, for that would be similar to believing that any time we post a selfie, the photo inevitably contains a reference to our death. A sinful thought — delictatio morosa. But wait! 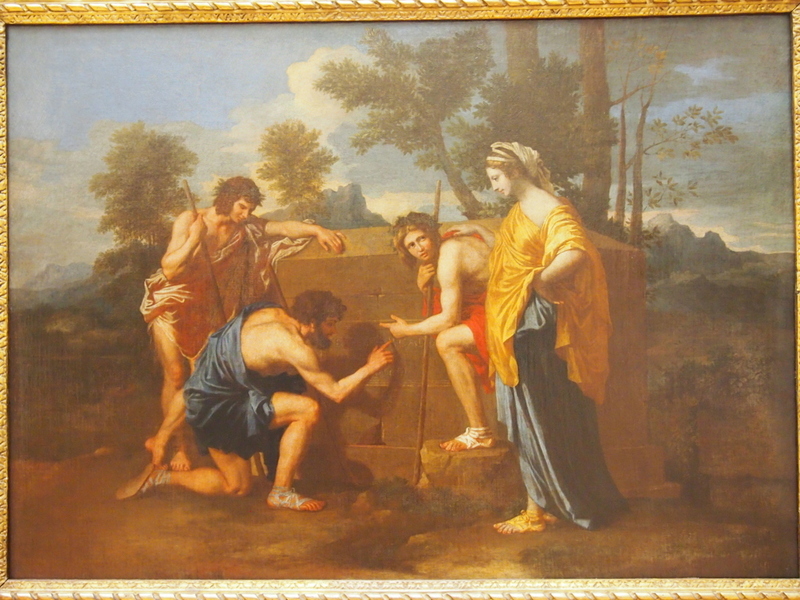 What would Poussin say? There are two possible interpretations for the Latin inscription that the Greek shepherds are trying to decipher in the painting. One that assumes that this is a real grave site of another shepherd and the epitaph confirms that he is local. The other is a little more abstract and awkward, for it is in poor Latin. What else to expect from an Arcadian? And so it conveys a bizarre idea that death itself speaks to us here. That is there is no dead body inside the sepulcher and the empty sarcophagus serves as a personification of our mortality, for even in Arcadia that beautiful thing called life has to end. And in the end we see that there is really no contradiction between the variant interpretations, for cemeteries, funerals and coffins bring about not very cheerful ideas that are relevant to us and are usually quite awkward to express. Medieval Western Europe was made out of three traditions: Classical, Judaic and Germanic, where Christianity served as a cement for what was there before and what came after. This large topaz was carved in antiquity and later framed by the Merovingian jewelers – precious stones were believed to have apotropaic qualities, warded off evil and were likely to end up in treasuries of famous cathedrals. 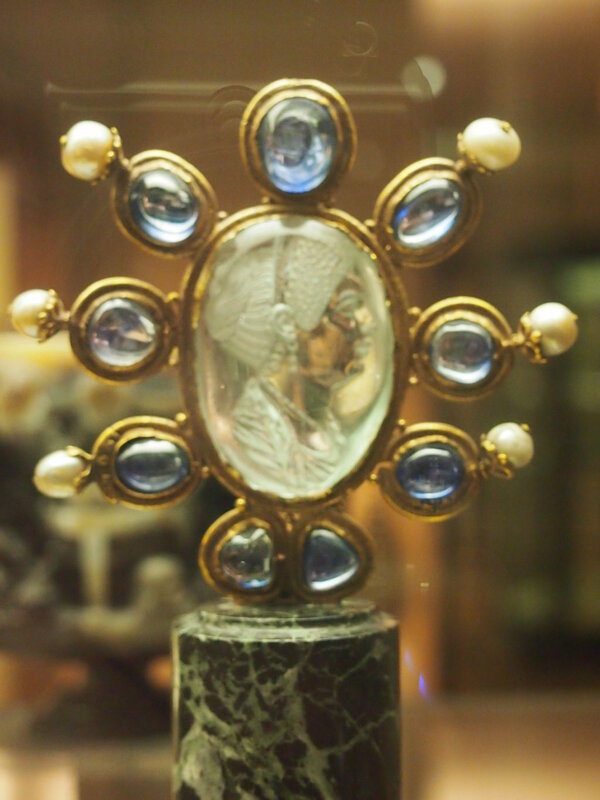 All Medieval jewelry had a meaning of talisman. 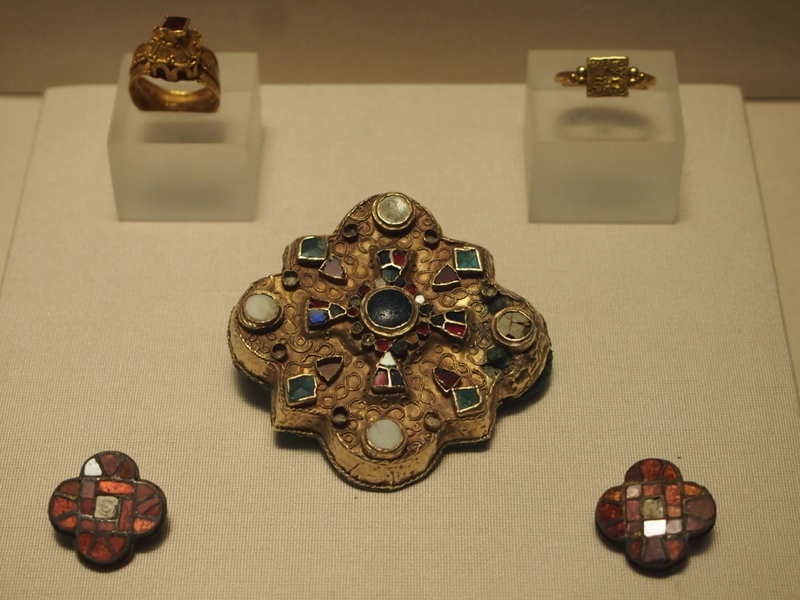 The wedding ring, for example, was symbolically placed on three different fingers; this is why Eleanor of Aquitaine wore three of them on her right hand. 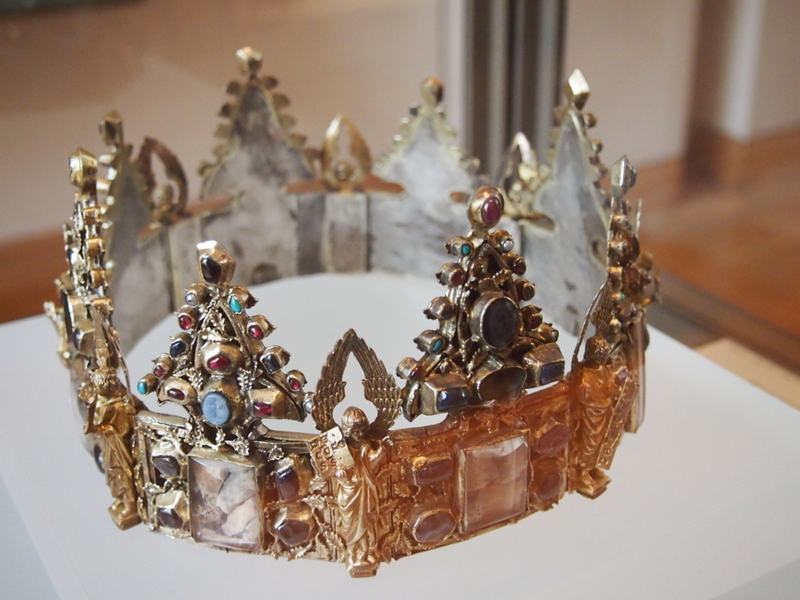 This crown displays all the properties of talisman: it is not just a victor’s wreath, the way it was understood in antiquity, but primarily a reliquary that is a repository of physical remains of holy men – their teeth, hair, nails, and pieces of bones, as well as various splinters, shreds and threads of coffins, crosses and shrouds, especially the much prized souvenir of war tourism, the True Cross from Golgotha. 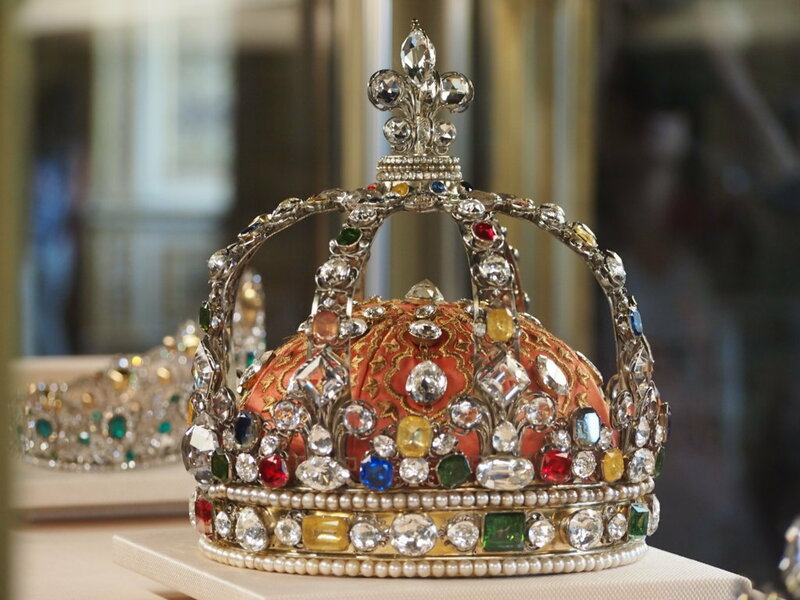 This crown, which is the crown of Louis XV, was also used as a repository of precious stones — the so called jewels of the crown. Right away we feel the ambiguity of expression, for the jewels of the crown means the jewels that belong to that frame on the day of coronation and are later pried out to be worn separately, as well as all the jewels of extraordinary value that happened to touch the royal person, and are of historical significance. All that is easy enough; however, there is the third meaning that can be challenging: Did you know that even to this day the French Republic doesn’t rule in its own right, but serves as a regent to the crown?